I began working at Music & Arts in 2011 and have been here ever since. I've been involved with music since I was nine after taking a liking to the string bass. Shortly there after I took a liking to the piano and bass guitar and further excelled in my passion for music through my grade school years. 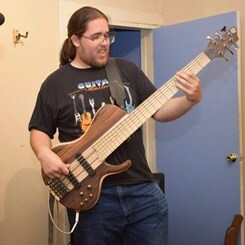 In high school, I was the principal bassist for three years and taught privately to a handful of middle school students. I have now graduated from Furman University with a Bachelor of Music degree in Double Bass performance. While at Furman, I continued to teach as well as perform in various theatre pit orchestras, jazz combos, big bands, and with the Furman Symphony Orchestra, where I was principal bassist of the symphony from fall 2014-2016. I'm also a bass section member for the Hendersonville Symphony Orchestra. On the side, I spend my time playing in a three piece band called Groove Matter that dabbles in the rock/funk/blues genres. My primary expertise would be categorized in string instruments and piano/keyboards. Our staff here in Spartanburg has been fantastic over the years and we encourage any and everybody to come by to talk music with us!